I’ve been thinking a lot about the topic of infill. Has Westboro reached a tipping point? Or have we passed it already? Who gets to decide what a neighborhood looks like? The people who live there? The developers? a.k.a People who are driven by money to be earned here? I’m sensing a lot of despair and hopelessness mixed in with an equal amount of anger and frustration about how this neighborhood is growing. It must grow – that’s a given – but why can’t we manage to find a way that works? Here’s an article about infill that was written by Tudor Robins and published in Ottawa Magazine a few years ago. I am linking to it with her permission. Funny how some things haven’t changed. Share the post "Searching for equilibrium"
5 Responses to "Searching for equilibrium"
We have something proposed for the 1/2 lot across the road I want to object publicly to it, but at the same time feel hopeless, as I see these hideous infill things getting stuck in little spaces everywhere here in Hintonburg. My opinion isn’t going to matter to the people who will decide it’s going in. Ugh. Haha, has someone really written that? Good for them. (Was it you? ;) That is quite a small lot with a really inappropriate design going in. Quite honestly, in this case isn’t it partly the homeseller who gets to decide what the street will look like? 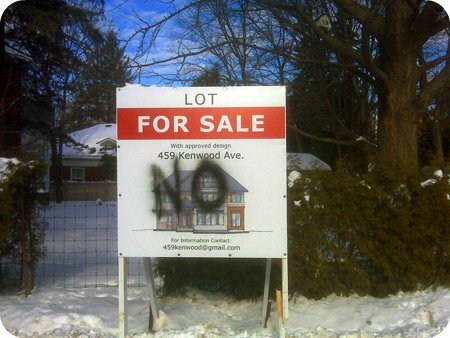 She’s the one who agreed to split the lot on selling and sell to a developer with plans for a too-big (and ugly) house. But in the case of moving away from the area and being in the position to make a killing on a double lot, wouldn’t many of us do the same? It’s tricky. Melissa: I was talking about this with someone yesterday. Public objections and petitions don’t seem to be cutting it anymore. As she said: “People around here just don’t get mad enough!” I’m not advocating that anyone lie down in front of a bulldozer but I think she has a point. You’re right, it is partly the homeowner that is deciding what the neighborhood would look like. For what it’s worth, we live on what amounts to be a double lot too. In fact, the first thing the real estate agents told us when we looked at our place was that we can split it and make some $$ off it. But here’s the thing… I could never do it! Never. You know it appears these types of things are not isolated. Here in our SW Toronto neighbourhood, where many little bungalows sit beside monstrous cardboardbox-type infill McMansions, it boggles my mind too. The people who purchase the mansions are attracted to the neighbourhood because of how the neighbourhood looked BEFORE they built the large house, yet they won’t go live in Suburbia where large houses like that exist side by side with all the others. Why do they move here? What attracts them to our little neigbhourhood? And when they do come, why do they insist on changing the look and feel of its current state?